This fruity and highly versatile strawberry sauce is ideal for milkshakes. The high fruit content of Carte D'or Strawberry Topping makes it perfect for ice cream and all pastry applications. Contains Soybean and products of these and Sulphite (=/> 10 mg/kg). Serve as a pour over topping on scoops and soft serve ice-cream and for fine piping on plates for enhancing appearance of desserts. Also use for enhancing the flavour of Strawberry milkshakes. Ambient (Store in a cool and dry place, away from direct sunlight). Store in refrigerator after opening. 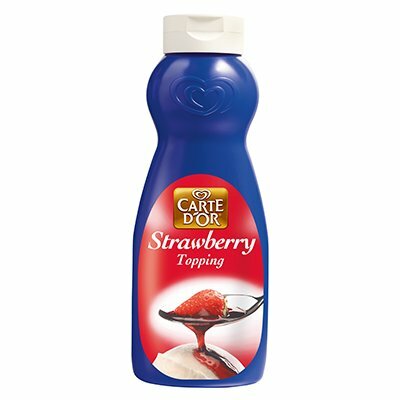 Try folding our Carte D'or Strawberry Topping into some whipped or butter cream as a filling for cakes.